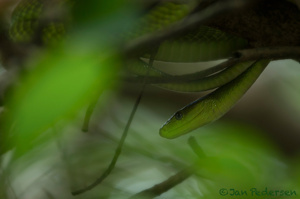 Eastern Green Mamba in mangrove forest. It was my third species of the mambas and a long wanted and awited one. I took my photo-group to the highly interesting Jozani Chwaka Bay National Park on Zanzibar to photograph the endangered Zanzibar Red Colobus Monkeys - found only on this island. Our eminent guide Hassan Mohammed found the snake coiled up 20 meter inside an impassable mangrove-swamp.